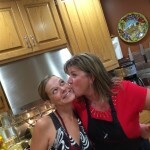 I finally got some cooking time in my kitchen with my wonderful friend Jen who lives about an hour away. 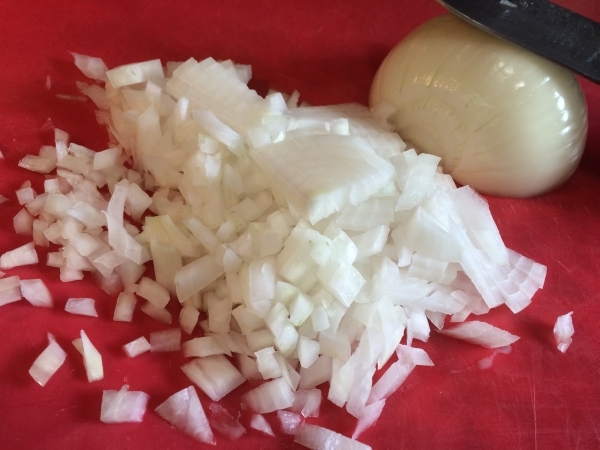 Life is busy, so we don’t see one another as often as we would like, but when we do, we usually spend hours and hours together in the kitchen. 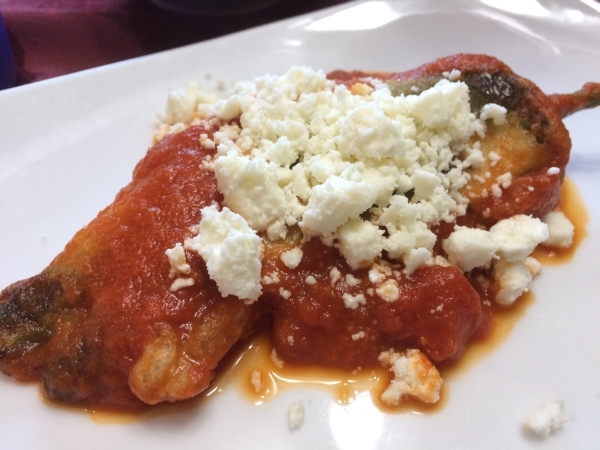 One of my favorite things to order when we eat Mexican cuisine is an authentic Chile Relleno, which means stuffed or filled in Spanish. 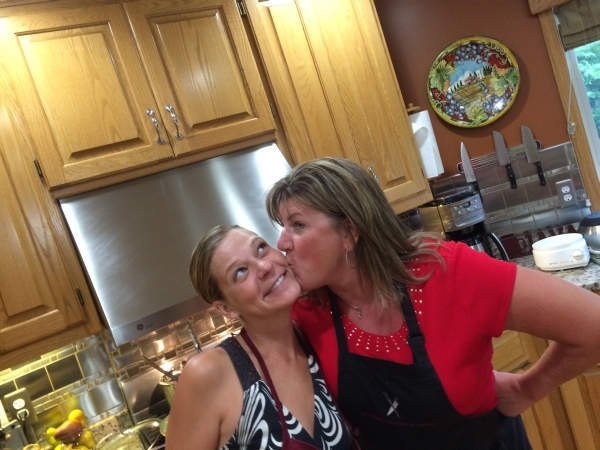 Jen has prepared these numerous times with success, so it was her turn to share her best practices with me! 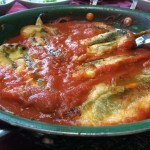 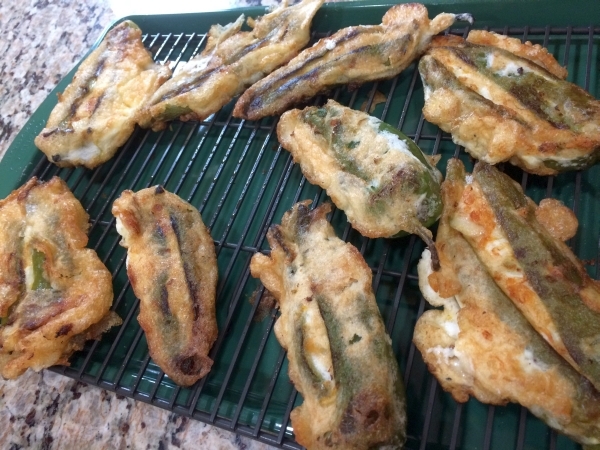 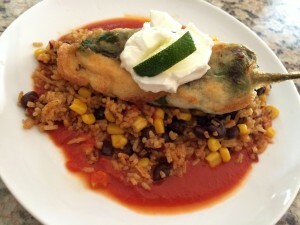 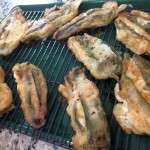 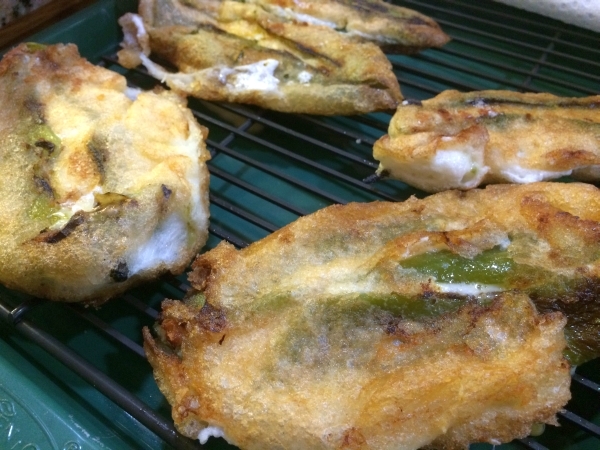 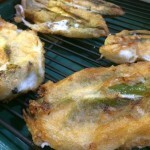 Chile Rellenos are a Mexican version of comfort food that also pleased our bunch! 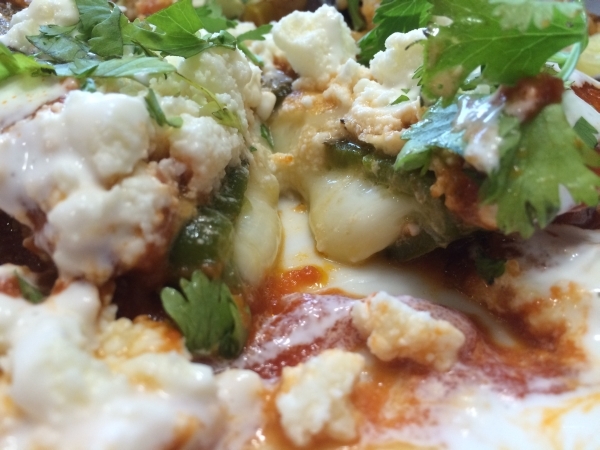 Their fillings can range from ground or stewed meats, to a variety of vegetables but our version sticks to classic cheese, which adds a creamy, smooth flavor to this Mexican specialty! 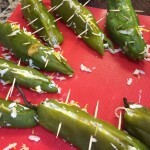 They turned out absolutely delicious and are really not hard to prepare! 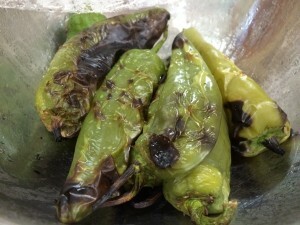 We also served a variety of other sides, so we figured on one per person. 9 Anaheim Chile Peppers, charred, peeled and de-seeded. 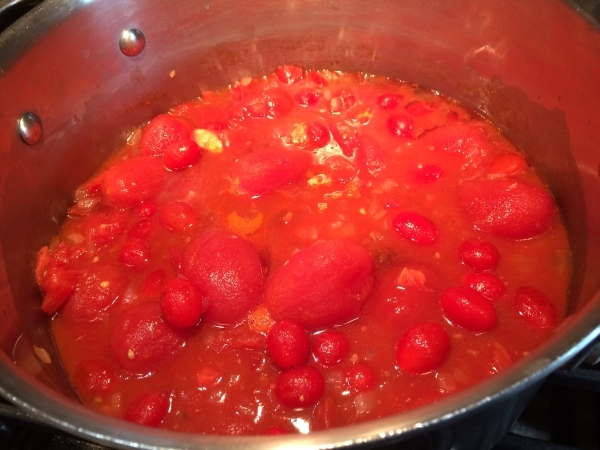 This Red Sauce isn’t Jen’s typical recipe. 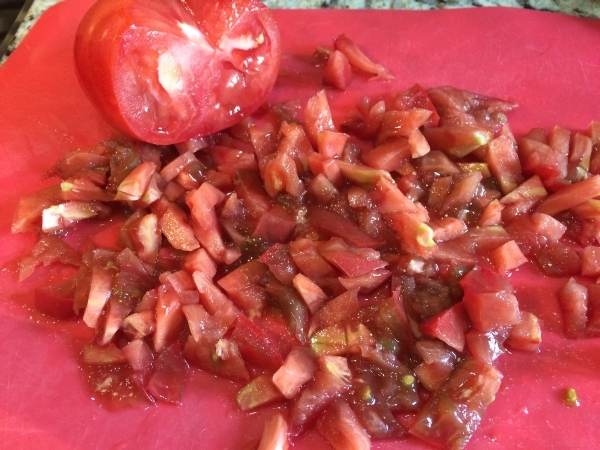 She usually uses just the canned tomatoes and chipotle peppers reduced; but since we both had fresh, tomatoes on hand to use up, we created this together based on our combined creations and there was left overs for another dish! 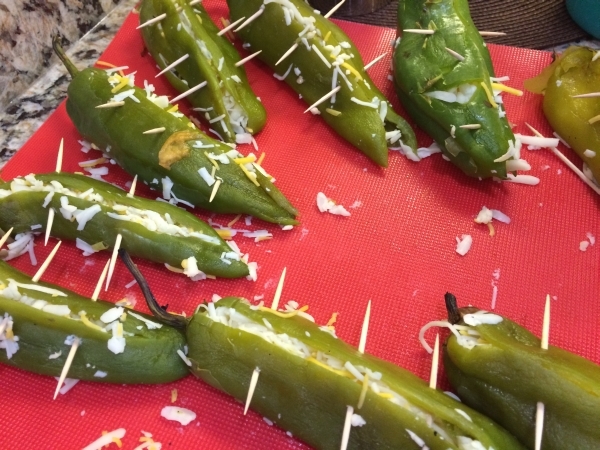 Prepare to char the peppers in your preferred method. 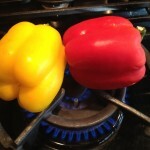 I typically do them directly on the gas burner just like I’ve done with these sweet bell peppers pictured. 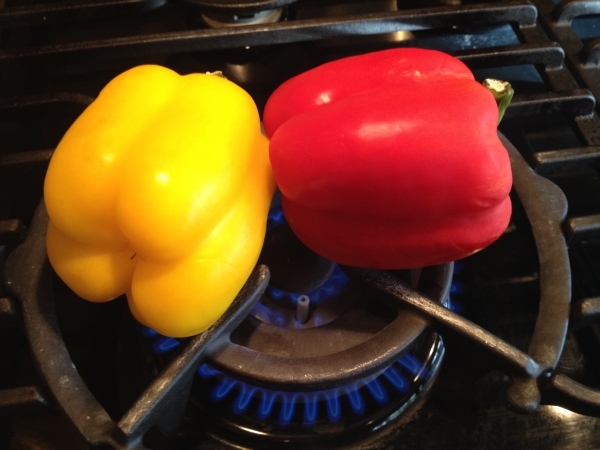 Wash the peppers and turn the burner to high heat. 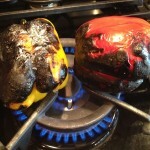 Place the peppers directly over flames and turn frequently to cook and blacken peppers on all sides. 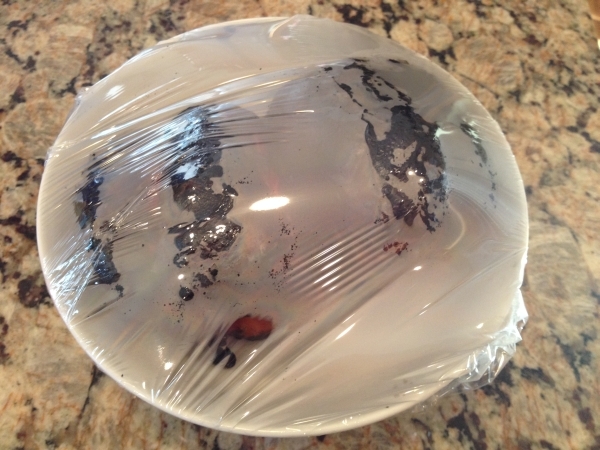 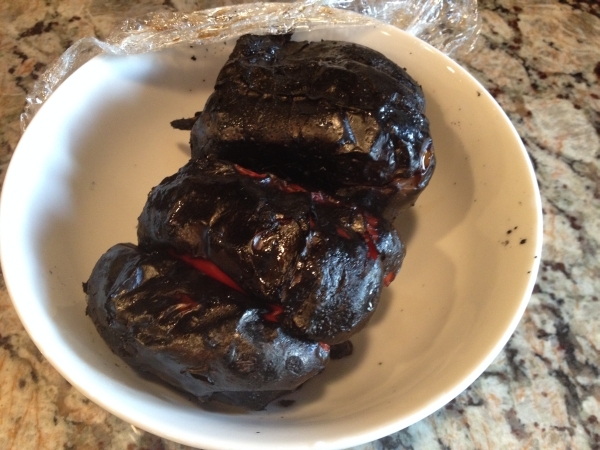 Place the blackened peppers into a bowl and cover with plastic wrap, letting them steam for ten to 15 minutes. 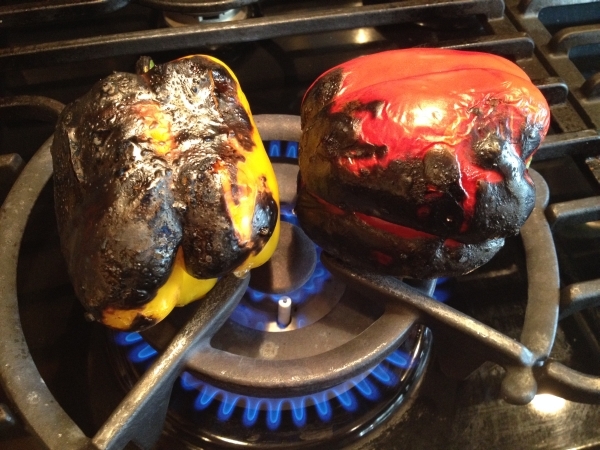 Peel off the blackened layer, using your fingers, a paring knife and/or a paper towel; it should fall off easily. 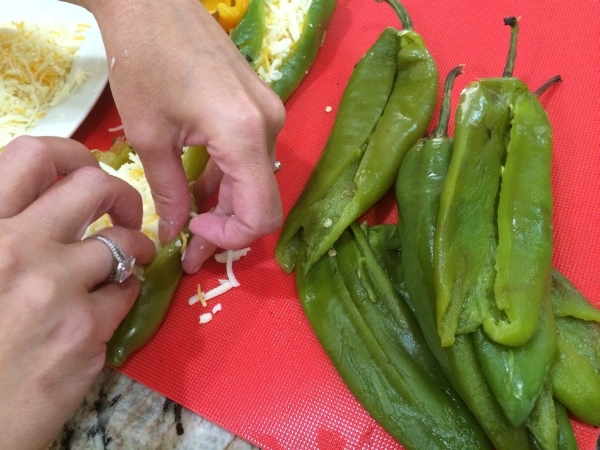 Use a small knife to make a lengthwise slit along the side of each chile and carefully cut out and discard the seeds and membrane. 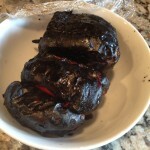 Jen and I used the gas grill, since we had so many other items cooking inside. 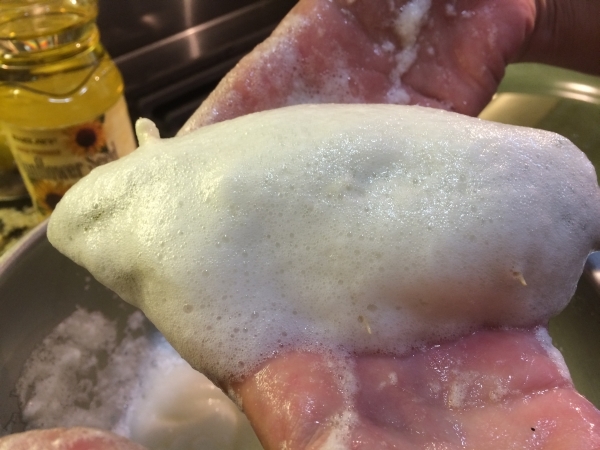 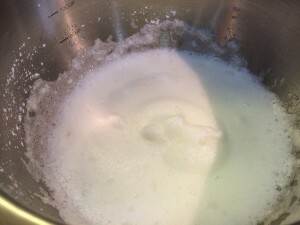 Whisk the egg whites and corn starch with an electric mixer until the whites form stiff peaks. 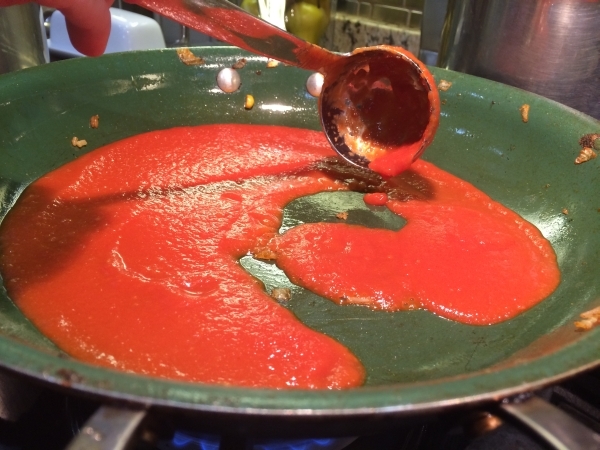 Meanwhile, prepare or heat your red sauce. 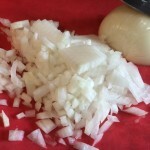 Over medium heat, saute onions and garlic in olive oil until translucent. 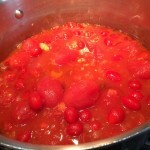 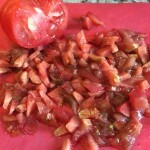 Add all of the tomatoes, including sauce and paste and simmer until reduced, about a half hour to an hour. 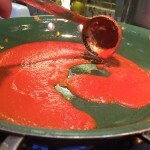 Use an emulsion blender to puree until smooth and season with salt and pepper, to taste. 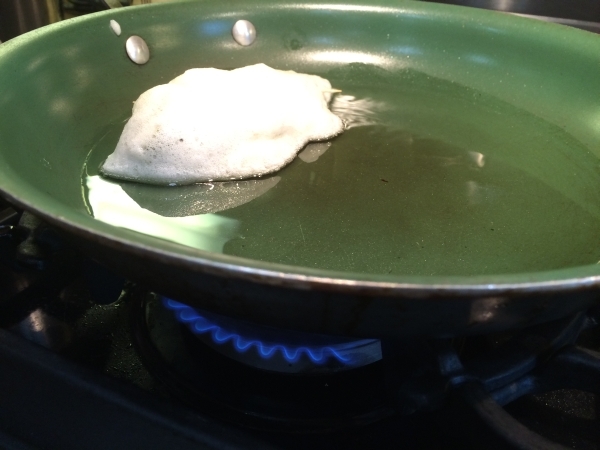 Pour about a half an inch of oil in a skillet and heat over medium-high heat. 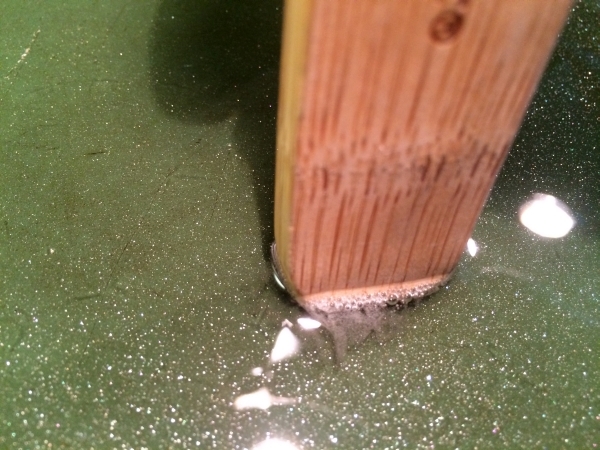 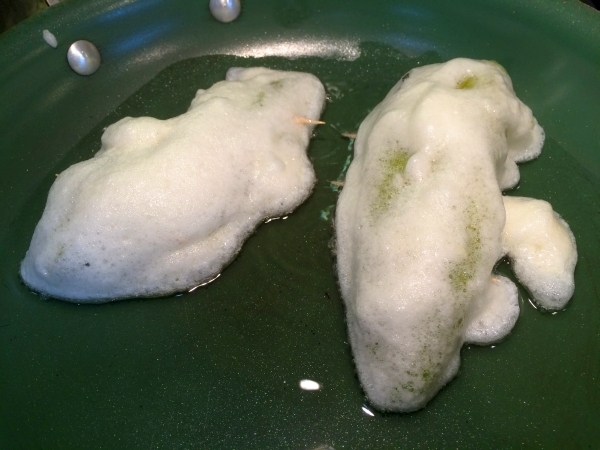 You can tell it is ready for frying when the back of a wooden spoon bubbles when placed into the hot oil. 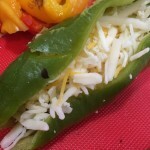 Roll each pepper in the egg white mixture and gently lay the coated peppers into the hot oil. 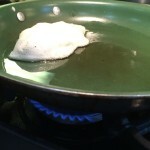 Fry until lightly browned on both sides, about five minutes per side. 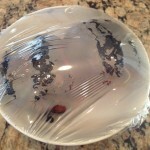 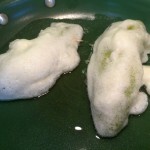 Place onto paper towels to remove any access fat and transfer to a cooling rack. 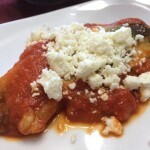 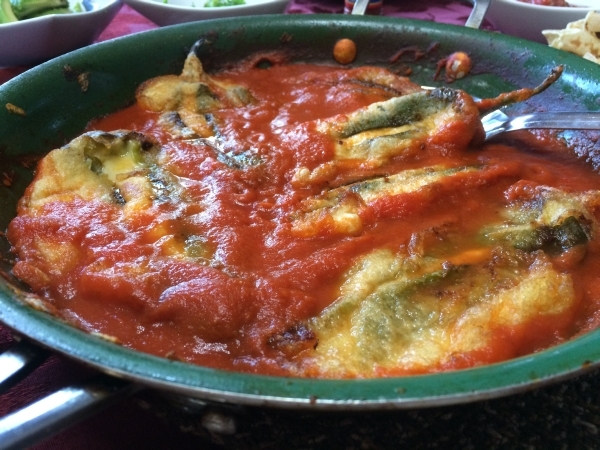 Once you are ready to serve, heat the sauce by spooning some of the sauce back into the pan and adding the chile relleno on top and heat through. 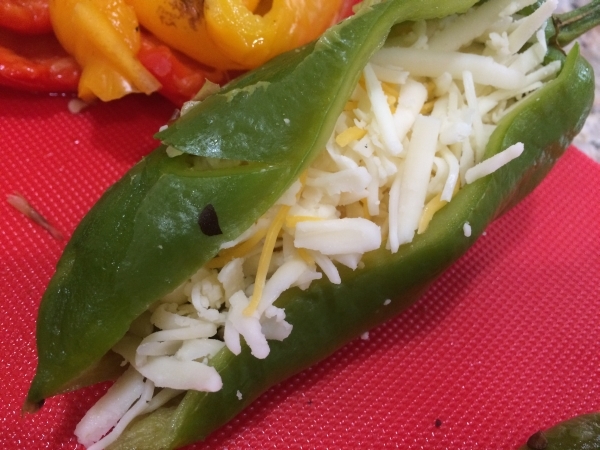 Serve with your favorite toppings. 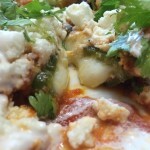 We used Queso Fresco, fresh cilantro, and Mexican crema. 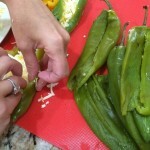 We also served Mexican style rice and pulled chicken taco’s, which were a delicious combination! 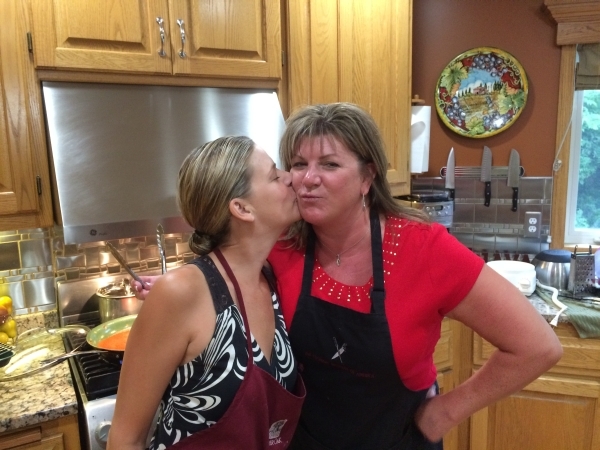 Jen and I always cherish our time together in the kitchen and had fun making amazing food and more great memories!